Hawaii is the hottest solar market in the US. Solar power there is much cheaper than electricity from any other source. But what exactly are the solar incentives available to homeowners and businesses in Hawaii, and what are the most interesting solar Hawaii facts? One study has projected that people who went solar in 2011 in Hawaii would, on average, save $65,000 over the course of 20 years. One of the reasons for that is that electricity prices are super high in Hawaii. The steep drop in solar panel costs in recent years has also helped, of course. And excellent solar insolation certainly doesn’t hurt, Then there is also the support that comes from federal, state, county, city, and utility incentives for solar power. Let’s take a look at those real quickly. As is the case all across the US, a 30% federal tax credit for solar power is available in Hawaii. Other than that incentive, below are a number of state-specific incentives. A Corporate Tax Credit or Personal Tax Credit is available for single-family residential, multi-family residential, or commercial solar projects. A 35% state tax credit is available for such projects. Net Metering is in place across the state, allowing solar owners to receive credits on their electricity bills for any excess electricity they generate. Though, there are some limitations and other details worth being aware of. Click on the link above for more info. Green Infrastructure Bonds that secure low-cost financing for clean energy installations are also available across Hawaii. Low-Interest Loans for solar PV or solar water heating systems (as well as various energy efficiency projects) are available through the GreenSun Hawaii program across Hawaii. In the agriculture and aquaculture sectors, special loans are also available for solar or other renewable energy projects. Solar Water Heating and Solar Attic Fan Rebates are available for customers of the Hawaiian Electric Company (HECO) and its subsidiaries, Maui Electric Company (MECO) and Hawaii Electric Light Company (HELCO). In addition to federal and statewide incentives, solar incentives are also in place in some cities and counties. Solar loans are available in Honolulu (city & county) and also in Maui County. Honolulu also offers property tax exemptions for solar (and other renewable energy) installations on a home or other building. The Kauai Island Utility Cooperative (KIUC) also offers zero-interest loans for solar water heating systems and rebates for solar water heating systems. For more details on Hawaii solar incentives and policies, check out the information provided by DSIRE. 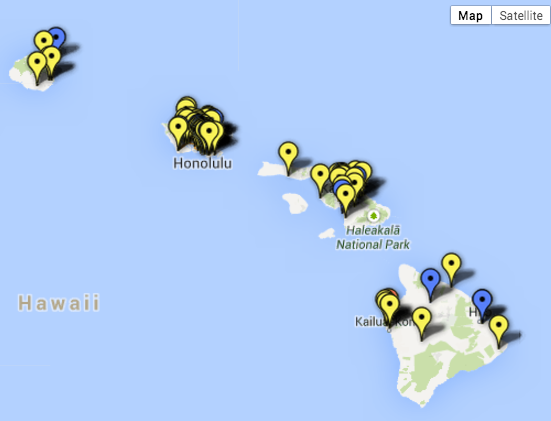 Locations of Hawaii Solar Companies. There are currently more than 80 solar companies at work throughout the value chain in Hawaii, employing 1,600 people. In 2012, Hawaii installed 109 MW of solar electric capacity, placing it 7th nationally. See more solar state rankings. The 270 MW of solar energy currently installed in Hawaii ranks the state 8th in the country in installed solar capacity. There is enough solar energy installed in the state to power 53,000 homes. In 2012, $471 million was invested in Hawaii to install solar on homes and businesses. This represents a 121% increase over the previous year, and is expected to grow again this year. Average installed residential and commercial photovoltaic system prices in Hawaii have fallen by 7% in the last year. National prices have also dropped steadily—by 11% from last year and 34% from 2010. While I love rankings as much as the next person, I love relative rankings much more than absolute rankings. Hawaii is a small state. Comparing its total solar power capacity or solar power additions to California’s or Florida’s isn’t super useful in most cases. To provide more useful solar state rankings, I have created per capita and per GDP rankings. Looking at these, Hawaii comes in at #2 for total and new (in 2012) solar power capacity per capita, as well as #2 for total and new solar power capacity per GDP. Compared to states and countries, it comes in at #7 for total solar power capacity per capita, #5 for new solar power capacity per capita, #11 for total solar power capacity per GDP, and #7 for new solar power capacity per GDP. The Wikipedia page for solar power in Hawaii notes: “A 2012 estimate shows that a typical solar system in Hawaii pays for itself in only 4 years, and returns a profit of over 4 times the cost over its life.” Impressive! If you’re in solar and have a roof, there’s almost no good reason you shouldn’t be switching to solar power.